A few sample products from all the categories of our fine cat accessories for people are listed below! You'll find lots more by rolling your cursor over the menu to the left. It's on every page of the site. When you roll over an entry, more specific sub-categories will pop out to the side. Click on a broader category to see all those items, or zero in on just the one you want. Links are also provided to each of the category pages below if you prefer to continue scrolling down. Music About and For Cats! Okay, so maybe your cats don't play the piano. But we old maid cat ladies like music about cats. And did you know that there's even music written for cats? Click the image at left to shop our complete selection of Cat Audio Products. Items for Cat Ladies' Cars! Yeah, you know if we really had a car like this, you'd want one. We don't...but we do have several other cat-related items for your vehicle. Click the image at left to shop our complete Cat Automotive selection. Know someone getting Bar or Bat Mitzvahed? While we don't have a huge assortment of these cat-themed items for Bar and Bat Mitzvahs, it's pretty cool that we have a few, isn't it? Click on the image or the link to view them. Mazel tov! Then you're shopping in the right place! We have a few cat-themed items to make your birthdays happier. More will be added as we find it. Click on the image or the link to see them. Does the computer repair guy bring his special vacuum cleaner when he visits, to get all the cat hair out of your computer? We understand. We have a few items to help you support your cat habit as you operate your business. These are not all cat-themed, but they should appeal to your revenue-generating side. Click the link above or the image above left to shop our assortment. Calendars become available in late summer and sell out by about early December every year. Click the text link here or the image at left to shop all our cat calendars. We also have links to affiliated retailers who sell calendars year-round. There's no need to keep sneezing and wheezing! We offer several products to help you combat your cat allergies so you can continue living with your felines companions. They include natural remedies, air cleaners, and more. Click the link above or the image at left to see them. Losing a cat never gets any easier, no matter how short your time together or how many cats you've lost. We've been there and understand. Because we know what you're going through, we offer many items to help you remember and grieve your fallen feline companion. Click the text link or the image above to shop them all. For all those budding cat lovers, we have the material you need to indoctrinate...we mean "educate" them. We have a wide assortment of children's cat books. View the whole assortment, or shop by the child's age or by popular authors. Click the text link or the image above to shop that section of the site. While we don't have any baskets of kittens, we do have a lot of cat-themed items to help you have a Meowy Christmas. Click the link above or the image at left to shop our entire Christmas section. Cleaning Products for Cat Staff! You know your role in the household hierarchy. Even if you don't use your cat as a dust mop, you want to keep the house as clean as you can. We offer products to clean up after cats, as well as those that are safe for use around cats. Click the link above or the image at left to shop our entire assortment of cleaning products. We've just found a couple of suppliers who make cat-themed clocks. Some of our affiliated retailers have a few more. If you make one and would like to sell it here, get in touch with us! To shop our current assortment, click on the text link above or the image to the left. Cat-themed Apparel for Cat Lovers! Sure, our assortment of cat-themed clothing is mainly T-shirts, but we're always looking for more! Click the link above or the image at left to shop our entire collection. If you're a designer who makes cat-themed apparel and would like to sell it on Old Maid Cat Lady, reach out to us! We'd love to have you aboard! We don't suggest collecting too many live cats; that's known as hoarding, and will get you on the evening news. But collecting cat-related inanimate objects is perfectly acceptable! Click the image of the kitties on shelves or in the text link here to shop our assortment of Cat Collectibles, including some from affiliated retailers. This is another area where we don't have many items yet, but there are a few. If you need a gift for a little cat lover who's being confirmed and taking first communion, take a look! ...and your neck, and your lapels, and your fingers, and your wrists! And because it's costume, you can actually afford it. We have a nice assortment of affordable but nice cat-themed costume jewelry. Click the link above or the image at left to shop for more, including some from affiliated retailers. Cat Craft and Hobby Books! If you like to make your own cat items, or have a hobby that you'd like to make cat-related, we actually have books for you. Click the link above or the image at left to shop the entire assortment. Eco-Friendly Products for Cat Lovers! Love your cats, but also love the earth? We have a wide variety of eco-friendly cat products that will keep you and your kitties happy. Click the link above or the image at left to shop this section. If you're daddy to a cat, or if your father is, you'll want cat-themed items to celebrate Father's Day! We have a few; click on the link above or the image at left to see them. Okay, so a cat reading a book may be stranger than fiction. But we have plenty of cat fiction books (oddly, a lot of murder mysteries) to keep you entertained when you're not watching your kitties. Click the link above or the image at left to shop our entire Cat Fiction section, which includes the option to shop by popular authors. Fine Jewelry for Cat Lovers! When only the best will do, we have a nice assortment of fine jewelry depicting cats. Whether you're buying it for yourself or to impress that special someone, you'll surely find something to please here. Shop the entire collection or shop by type of jewelry (pendants, rings, earrings, bracelets), with a special section just for sterling silver pieces. Click the link above or the image at left to shop our entire Fine Jewelry department. The best garden accessory, as we all know, is a cat. And cats love the garden. But we also need other items for our gardens, and why not make them cat-related? Click the link below or the image at left to shop our entire Cat-themed Garden Accessories department. Know What Makes a Great Graduation Gift? Aside from a cat, we have a few suggestions (a very few) cat-themed gifts for graduates. We'll find more...eventually. Click the link above or the image at left to shop these items. If you buy these online, we do have a few cat greeting cards. Click the link above or the image at left to shop our entire assortment. While we may not have a cat-replica handbag (oh, those wacky Hollywood stars! ), we carry a few cat-themed totes, handbags, wallets, and luggage with feline themes. Click the image at left, however, to visit our Handbags, etc. page, where you'll find more. Again, we don't have a huge assortment of cat-themed Hanukkah (or is it Chanukkah?) items, but we have a few. Click the link above or the image at left to see them; mazel tov! You can't wear your cat to work. So you'll have to find another way to keep your feet warm. Fortunately, we carry some cat-themed socks to help you out. Some of our affiliated retailers even have cat hosiery! Click the link above or the image at left to visit our Hosiery & Socks page, where you'll find them. Did you hear the one about the cat? Of course you did. But if you're looking for some new cat humor, we have the books for you. Click the link above or the image at left to shop our full collection of Cat Humor Books. What this dish needs is...a little more cat hair! Even if your cat doesn't help you cook, we have an assortment of upscale cat-themed kitchen accessories that will ensure you don't forget about your feline friend while you're cooking. Click the link above or the image at left to shop our entire Kitchen & Tableware department. Not everybody has a luminescent cat. If you're still waiting for yours, we have a small selection of cat-themed lighting solutions for you. Some of our affiliated retailers have more. Click the link above or the image at left to visit our Lighting page and shop the entire assortment. Cover your bed with cats! Oh...never mind, it already is! If your cats haven't completely taken over your bed, perhaps you'd like to decorate it with a few. We have a small assortment of cat-themed linens, and our affiliated retailers have a few more. Click the link above or the image at left to visit our Linens & Bedding section to see them all. We actually offer some multimedia items for or about cats. These may be books or games with audio or video components. Click on the link above or the image at left to see them. Happy shopping! There are an awful lot of books about cats. Maybe that's because writers seem to have a natural affinity for feline companions. Whatever the reason, we've gathered the best of the nonfiction books about cats here on our site, for your shopping convenience. There are several subcategories of these books on the page, as well. Click the link above or the image at left to shop our entire Cat Nonfiction Books section. Cats Make the Perfect Home Office Accessory! We realize that your office is already accessorized with your cats. But if you need additional cat-themed office accessories, we have a small selection of them available. Click on the kitty peeking out next to the keyboard above to shop our entire Cat Office Accessories section. We're always looking for cat-themed original art to bring you. Click the link above or the image at left to shop our entire Original Cat Artwork section. You can even shop by artist. If you're an artist, artist's co-op, or gallery who'd like to open another door to selling your cat-themed work, there's information about how to sell your pieces through OldMaidCatLady.com on the Original Artwork page. Or you can email us directly to inquire. Of course old maid cat ladies throw parties with cat themes! To help you, we've compiled a small assortment of cat-themed party items. Click the link above or the image at left to see what we have, which is mostly through affiliated retailers. Patriotic Items for Cat Lovers! We don't have a huge assortment of these items, but what we have is on our Patriotic Cat Items page. We'll be adding more as we find suppliers. Cats are always inspiring artists to write poems, paint, draw, or take photos. And lots of publishers print books of this work! While this is another of our small sections, we think you'll be pleased with what you find here. Click the text link at right or the image at left to shop our entire Cat Poetry, Art & Picture Books section. Rugs are another area where we don't have a huge assortment yet, but what we have is on our Cat Rugs page. We've actually located suppliers for several more, but just haven't had time to get them on the site yet. Just "bear" with us and they'll be here soon...gives you a good reason to stop back by to see! Plenty of people still send traditionally handwritten notes...don't they? If you're one, we have been able to find a small assortment of cat-themed stationery for you. Click on the text image above or the image at left to shop this section. Toys and Novelties for Cat Lovers! Why should only our cats have toys? Kids of all ages will enjoy our assortment of cat-themed toys, games, puzzles, electronics, coloring books, novelties, sporting goods, and just plain old fun stuff. Click the text link above or the image at left to shop our entire Cat Toys for People section. We're rather proud of our assortment of cat-related movies and TV shows, and we think you'll be pleased with them, too. We've found not only movies about cats, but video products for cats, as well. And if it's a film that just had a cat in a pivotal or memorable scene, we've tried to include those, too. 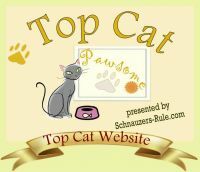 Click the text link above or the image of the cats watching TV to shop our entire Cat Video Products section. It's not enough to have cats lounging all over our houses; we like to decorate with them, too! To help you out, we've found an assortment of posters, decals, and other cat-related things you can put on your walls. Click the text link abover or the cat painting here to shop our entire Cat Wall Art section. Yes, cat-themed wristwatches are another area where we currently only have a limited supply of items. Some of our affiliated retailers have a few more. We'll be offering more as we find additional suppliers. In the meantime, click on the text link or imge above to see what we have now. When old maid cat ladies get married, it's a big deal. Not that we recommend you paint your faces like cats, the way this Russian couple did. But we do have a few cat-themed items to help make your wedding special. Click the image of the happy feline-esque couple to shop our entire Wedding section. AccessoriesAccessorize all your outfits with items that reflect your love for your feline friends! Here, you'll find costume and fine cat jewelry, cat hats, cat scarves, cat belt buckles, cat umbrellas, and everything imaginable with cats on it. Separate sub-categories for fine jewelry, hosiery, leather goods/luggage and shoes will help you find what you're seeking faster. Audio, Video & MultimediaAudio, video and multimedia products about your favorite felines. Music, sound effects, movies, video games...you name it, if it involves a cat, we have it! AutomotiveWhy shouldn't other drivers know how much you love your cats? In this section you'll find cat-themed car tags and tag frames, cat bumper and window stickers, cat car magnets, things to dangle from your rear-view mirror, and products to protect both your car and your cats when you travel with kitties. Baby & ToddlerFeline-themed baby and toddler products to instill that love of cats from an early age. BooksBooks about cats for adults and children. Cat Allergy RemediesAllergic to your little furry darlings? Not to worry! Old Maid Cat Lady has products to help you through it. Cat Memorials & Grief SupportLosing a cat is never easy. Here, you'll find urns, comforting gifts, cremation jewelry, and other ways to remember your lost family member, as well as books to help you through the grieving process. Cleaning ProductsProducts to remove cat hair, stains & odors, and cat-safe cleaning products for your home. ClothingAn assortment of clothing to show your love for cats. CollectiblesCollectibles with a feline feel for all cat lovers. Plates, figurines, salt & pepper shakers...you name it, if it's something collectible and has cats on it, it's here. CostumesCostumes to help you take on the persona of your feline friends for Halloween or that next special event! Garden ProductsItems to take your love of cats out into your garden. Cat planters, cat watering cans, cat wind chimes, cat statues, cat stepping stones, cat signs, cat bird baths, cat garden furniture...if they make it and we can find a supplier for it, you'll find it here! Holidays & Special OccasionsCat-themed items to spruce up all your holidays! Not just Christmas, either. You'll find items for birthdays, Valentine's Day, Easter, Mother's Day, Father's Day, patriotic holidays, Halloween, and Thanksgiving, if they exist and we can find a supplier for them. Home DecorProducts to show everyone who visits your home how much you love your kitties! From cat furniture and cat figurines to cat wall hangings, cat clocks, cat curtains, and anything else for your home, we do our level best to offer it here. Office AccessoriesDesk accessories to show your love for cats. Letter trays, letter openers, tape dispensers, tissue box covers, desk lamps, blotters, memo pads, note paper holders, pencil holders, mouse pads, technology covers, and everything else you use in your office...if it has a cat on it and we can find a supplier for it, we want to carry it! Ditto for cat-themed school supplies. Original ArtThroughout time, artists have used the form of the cat as inspiration. Here, we bring you artistic representations of cats from original artists. Paintings, sculpture, drawings, lithographs, block prints, photographs...you name it, if an artist creates it and it has a cat in it, we'll offer it here! Stationery & Paper GoodsAll the games and paper goods you'll need to show your love for cats. Journals, cards, note pads, etc., with sub-categories for calendars, stationery, greeting cards, and party supplies. Toys, Electronics & Sporting GoodsToys for cat lovers of all ages! Stuffed plush cats, cat marionettes, cat games, cat collectibles, cat puzzles, clockwork cats, cat dolls...if it's a toy related to cats in any way, we'll have it here. But this is so much more: cat-themed electronics and sporting goods are also in this category. Life Beyond the KittiesSure, we love our cats, but all old maid cat ladies have aspects of their lives beyond their cats. We have to earn a living, we have to socialize, and we have to take care of ourselves. Old Maid Cat Lady can help you out there, too.